Ginseng has been known for its outstanding medicinal efficacy since 2000years ago, and its main production area is South Korea. In Samguksagi (History of Three Kingdoms), particularly in the chapter on King Seongdeok and King Hyoso, there is a line that says, “Ginseng was sent to Tang as a gift.” According to Hai Yao Ben Cao (Materia Medica of Herbs from Across the Seas) by Li Xuan of Tang, ginseng was produced in the Silla kingdom. What was offered to the king was “something shaped like a hand or a leg.” Its production country and shape are clearly described. What is the etymological source of ginseng? In in-sam, the Korean word for ginseng, sam was actually used in various medicinal substances. There is sae-sam (bird ginseng) in the sky, which was fermented from ginseng seed eaten and released by birds, hae-sam (sea ginseng) in the sea, and in-sam (ginseng) on the earth. The colors are diverse. Hyeon-sam (black ginseng) is used as a fever reducer and anti-inflammatory agent, and dan-sam (reddish ginseng), a flowering plant, is used as a styptic. In addition, sa-sam (sand sand), a type of bellflower root, is used as an expectorant and liver antidote, and ja-sam (violet ginseng) is used as fever reducer and cough remedy. All these plus go-sam (bitter ginseng), a bean type used as an anthelmintic, are called o-sam (five types of ginseng) (Shennong Bencaojing or Classic of Roots and Herbs by Shennong of the latter Han Dynasty). Actually, prior to the Joseon period, the character sam (蔘, ginseng) was used as sam (參). This is true for China. In the pure Korean phrase sim-bwatt-da, sim means “ginseng.” Sam (參) denotes the constellation of Orion of 28 constellations. It also means a loyal official to a king, and a filially pious child. The word in-sam (ginseng) steams from ginseng’s human-like shape, and in-sam is regarded as the highest spiritual thing created from exchanges between heaven and earth. In other words, in-sam (ginseng) is a medicinal herb created by heaven and earth, and is meant to serve as a faithful subject to the king and a filially pious child. Describing such Japanese situation, Yi Ik, a pragmatist from Joseon, mentioned in his book titled Seonhosaseol (Treaties on Practical Topics), that “the Japanese people, when becoming seriously ill, have to use ginseng. Those who fail to get ginseng would die. Thus, if Joseon stops exporting it, it will cause death and conflicts, so exports were inevitably allowed.” Also, in China, until the 18th century, when the parents were deeply ill and the children had no money to buy ginseng, they borrowed Korean ginseng from merchants of medicinal herbs, put it on the table, and showed their filial piety to the well-wishing visitors. These anecdotes showed the popularity of Korean ginseng. 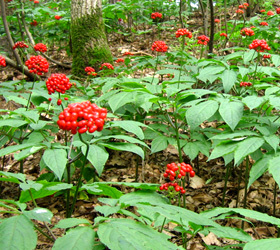 Ginseng, a medicinal herb, is very sensitive to the soil on which it grows. It hates dryness and humidity, and it cannot stand the hot summer sun. Paradoxically, however, this particular characteristic gives it strong medicinal efficacy. As such, it is very sensitive to its cultivation environment. In the Jin and Yuan dynasties, a famous doctor, Lee Dong-won, also known as Uiwang (king of doctors), made mention of ginseng’s stamina-(yang spirit)-boosting efficacy. Needless to say, this ginseng efficacy is surprising. Once it is planted, it grows on the soil at the same location and absorbs all the earth’s power for four to six years, exhausting the soil and leaving it to have to be idled for the next ten years before it is used again for cultivation. Also, ginseng’s efficacies become different as it grows. One- to two-year-old ginseng improves the digestive function while older ginseng strengthens the pulmonary and renal functions as well as the intestines and muscles. Finally, Five-year-old or older ginseng facilitates the mental and sensory functions. Donguibogam explains the efficacies of ginseng in detail. Ginseng calms the mind, improves the eyesight, opens the holes in the heart, and betters the memory. Notably, it restores the energy of persons who have become weak due to long-time fatigue. 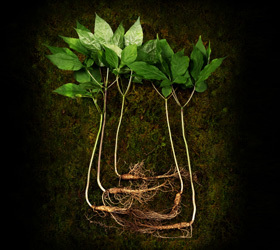 These ginseng efficacies are being proven by modern science. Scientists recently reported studies in which ginseng was found to boost the effects of influenza vaccination, and to treat liver diseases. This is because ginseng’s ingredients energize the mental and physical spirits, revitalize the body, and bolster the body’s immunity. Of the OECD member nations, South Korea has the longest work hours. This explains why many people in South Korea are suffering from chronic fatigue, which leads to fatigue that is not easily released, accompanied by a sense of all-day-long boredom and lowered concentration and memory. Finally, it lowers the immunity. Ginseng is an ideal medicinal herb for these people.